Using the same technology NASA employs to tell time, the Model 1500E wirelessly synchronizes with the National Institute of Standards and Technology's (NIST) atomic clock in Colorado. Perpetual calendar until Year 2099, changes year, month, date automatically and the time during Daylight Savings. Never needs resetting, keeps time and your settings during power outages. 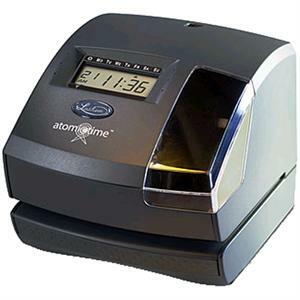 Provides manual, automatic, & semi-automatic printing selection, operating on an standard side printing time card, job card or form. Dimensions: 6.3" x 7.2" x 5.7"